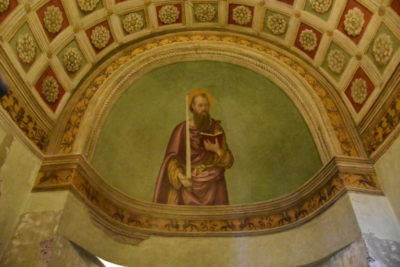 The Board of Directors of the Washington, DC Patrons of the Arts in the Vatican Museums is pleased to announce the completion of the Fresco by Antoniazzo Romano from the Basilica of St. Paul Outside the Walls. 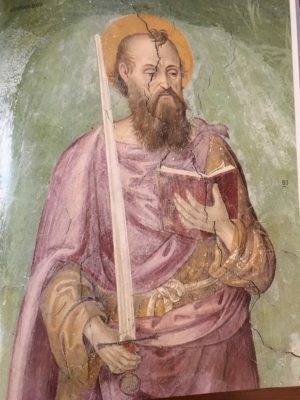 Those on the chapter trip in June were able to see the completed fresco and meet the restoration team, who described the process in detail. John Michael Cardinal Harvey, Titular Bishop of the Basilica of St. Paul Outside the Walls, greeted our delegation and expressed his appreciation and excitement of having this very important fresco restored. The project was adopted by the DC Chapter in March 2017, and completed in June 2018 at a cost of 35,500 Euros. Thanks to your generosity this fresco has been returned to its original beauty for future generations to enjoy. You can the see the Before and After pictures below. Thank you all very much for your continued support and generosity!